Just after the fall of the Berlin Wall in 1989, Julie and I went to eastern Germany. We slowly drove our rental car on cobblestone streets through Weimar on our way to the site of the concentration camp Buchenwald. with stoves, water heaters and clothes dryers. 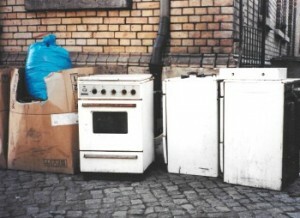 The change from the Russian gas service to the West German gas made these appliances suddenly scrap. I saw a Russian army officer walking the street uncomprehending. He would never been able to afford these appliances. A version of this trip is described in Part II of Stumbling Stone, when Sarah and Karl search for answers about his family history and their role in World War II. Last week, I had the opportunity to visit Cuba with my son and I saw things that reminded me of Weimar. Stately mansions were abandoned when Fidel Castro came to power. They have been crumbling for the last 60-odd years. The windows and doors are still open as they were when their owners fled. In the country-side, people live in rough, two-room cinder block houses, often with a cow or a horse staked in a patch of grass. The average worker in Cuba makes $11 a month while a doctor makes $54. Our bus driver Jaime’s wife was a physician. Jaime asked us to take shampoo, soap and toilet paper from the luxury hotel where we stayed; these are items are rarely available for most Cubans. At various spots, we would stop and give Jaime’s wife the soap and such from the hotels. She sold them to augment her salary. But one thing can be said. 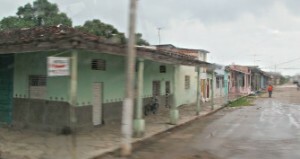 In Cuba there is social equality. Almost everyone is equally poor. I spent an evening with our Cuban tourist guide and asked her what she thinks about the move to normalize U.S.-Cuban relations. Her eyes lit up and she told me how good things will be in the future. I did not have the heart to tell her that I think this will bring riches for a few but continued poverty for most. As in Eastern Germany after the Berlin Wall fell, this could be the end of social safety and predictability that the Communist government now provides. Our tourist guide thought I only wanted to scare her. I remembered that when I talked to my eastern German cousins several years ago, they spoke longingly about the old days. I fear the same will be true for Cuba.